About "Remaking the American University"
At one time, universities educated new generations and were a source of social change. Today colleges and universities are less places of public purpose, than agencies of personal advantage. Remaking the American University provides a penetrating analysis of the ways market forces have shaped and distorted the behaviors, purposes, and ultimately the missions of universities and colleges over the past half-century. The authors describe how a competitive preoccupation with rankings and markets published by the media spawned an admissions arms race that drains institutional resources and energies. Equally revealing are the depictions of the ways faculty distance themselves from their universities with the resulting increase in the number of administrators, which contributes substantially to institutional costs. 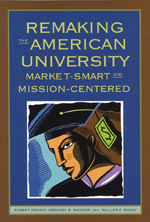 Other chapters focus on the impact of intercollegiate athletics on educational mission, even among selective institutions; on the unforeseen result of higher education's "outsourcing" a substantial share of the scholarly publication function to for-profit interests; and on the potentially dire consequences of today's zealous investments in e-learning. A central question extends through this series of explorations: Can universities and colleges today still choose to be places of public purpose? In the answers they provide, both sobering and enlightening, the authors underscore a consistent and powerful lesson-academic institutions cannot ignore the workings of the markets. The challenge ahead is to learn how to better use those markets to achieve public purposes. From the reviews of "Remaking the American University"
"The authors' repeated call for a new and open ‘conversation' between all the stakeholders in the institution of higher education is ... an attractive goal. The decades-long change in the place of the university in U.S. society connects with a change in the spatial and temporal scale of production and consumption that a university is thought to embody. Are universities to be supported by federal initiatives, state initiatives, or individual family tuition dollars? Are universities to be seen as educating whole generations of youth over the long term or professionalizing individual consumers over the short term? Are universities to be seen as producers of long-term knowledge with global import or state and regional engines of short-term economic growth? And are university educations to be seen as key moments in the lives of their participants which provide a critical and unrepeatable foundation for lifelong future learning and wisdom or as transitory steps on a long and fragmented career ladder? Arguing that "members of academic communities do not talk enough, they do not talk to each other, and they do not talk about values" (p. 213) the authors of Remaking the American University remind us that such a conversation should be centered not only on individual-scale costs and benefits, but also on societal-scale problems and solutions. Readers should remember that this is a conversation that not only university managers but university laborers and their "markets" themselves need to engage in as well."